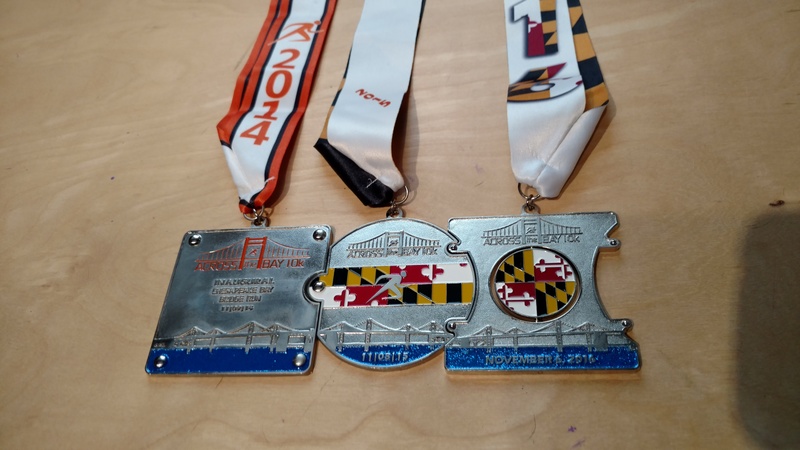 After running the Inaugural Across the Bay 10K in 2014, we learned that the medals for the first several years would all connect into a complete picture of the bridge. So although I was out of town for the 2015 race (running the runDisney Avengers race weekend), I still did the virtual option to earn the second medal. I couldn’t break my streak in 2016! The day before this race my husband and I ran the Inaugural Presidential 5K. By doing back-to-back races I was almost doing my own mini race challenge! 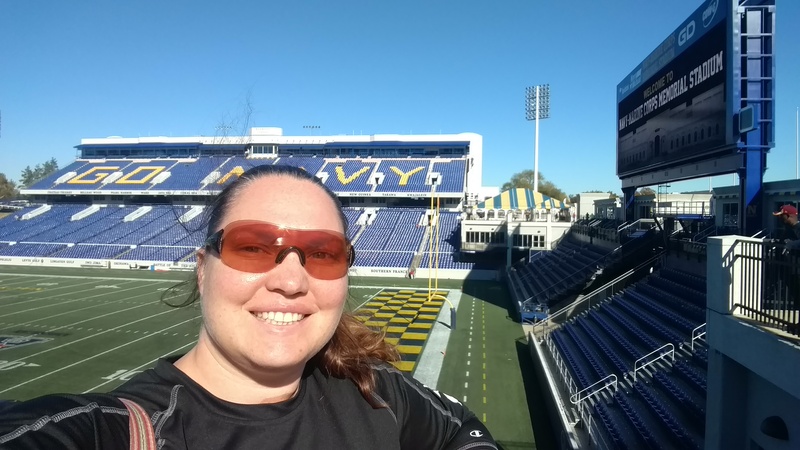 The race expo is held over several days at the Naval Academy football stadium in Annapolis. When I did this race in 2014 I went early on the first day. That year there was no line to get my bib or parking pass (given separately from the bibs), there was limited race-specific swag (most was only available after the race at the after party) and you had to walk through all of the vendors to get your race shirt. This year I attended the expo around mid-day of the final day. It started off good—there was no line to get my bib (because they have so many booths with only a few hundred numbers at each one) and my parking pass was included with my bib (so I didn’t have to make another stop). The shirt pick-up was moved to before the vendor area, which was a great layout change in my opinion. After leaving the race shirt area I entered a section dedicated to race-specific swag. There were several things with the event logo and some other stuff with topical political quips. I liked one of the jackets a lot but, just as with the race shirts, they were out of most sizes of this stuff, too. So I left this section and entered the main vendor area. Most of the vendors were ones that are pretty common at races in the Baltimore area, but since I like a lot of those vendors I enjoyed looking through their stuff. A quick walk through this section and then I was ready to leave. Despite the problem getting my shirt in a timely manner, I liked the design. The shirts were short-sleeve white tech shirts. The women’s version had pink print and the men’s version had lime green print. Just as with the 5K I did the day before, I didn’t really plan an outfit for this race. I hope I’m not losing my costuming mojo! 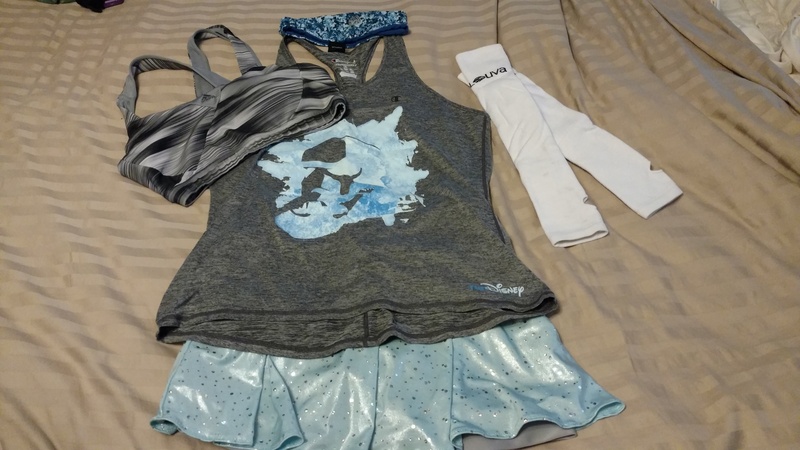 Instead I just picked something I thought would be comfortable from my normal running gear: light blue sequined Sparkle Skirt, blue and grey Storm Trooper tank top, grey and white Adidas sports bra, white Louva arm sleeves, blue camo print Dr. Cool headband, Injinji socks, New Balance 860v6 shoes with custom orthotics, Garmin Forerunner 620, and Nathan handheld water bottle. Runners are seeded into waves based on expected finish time. Your wave determines not only when you actually start the race, but also the recommended time for your arrival in your designated parking lot (because there is no parking at the actual race start, runners purchase parking passes to one of several lots on each side of the bay and then are bussed to and from the race). I was seeded in wave 10 (the last wave, I think) so I needed to get to the lot about an hour or so after the first busses departed. The closest lot to my house is at Anne Arundel Community College, which is where I parked when I ran the race before. I knew that traffic would back up on Route 2 and I allowed extra time to get there. Once I parked it was a simple walk down a hill to the busses, where I passed through a quick security bag check and got on a bus right away. Since I parked on the same side of the bridge as the race start, the bus ride wasn’t too long. After we were dropped off I wound my way around the buildings to the race staging area where I took some pictures of the bridge and visited a port-a-potty. Just like the 2014 race, the crowds were so big as the later waves waited to start that there wasn’t a lot of bib enforcement (other than simply checking that you had one and should be allowed on the bridge). Sometime after wave 7 I started making my way over to the starting chute. I ended up starting with wave 9, which was one before I was supposed to go. 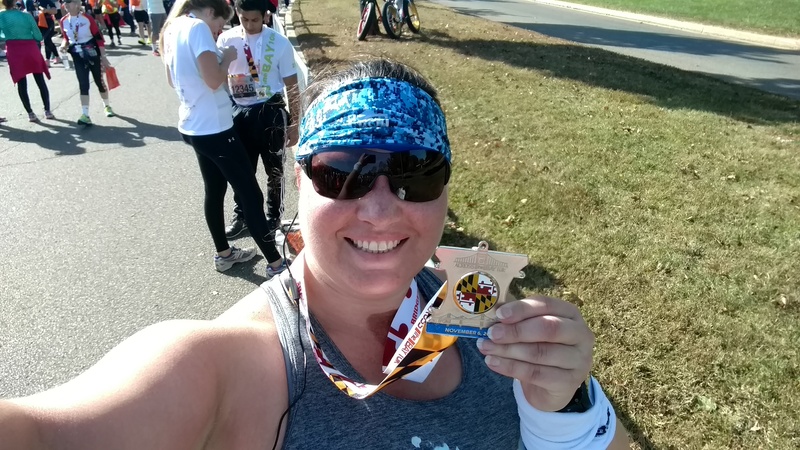 The course is pretty straightforward: you start at a Maryland police barracks on the Annapolis side and point yourself toward the bridge, which you arrive at after the first half mile. 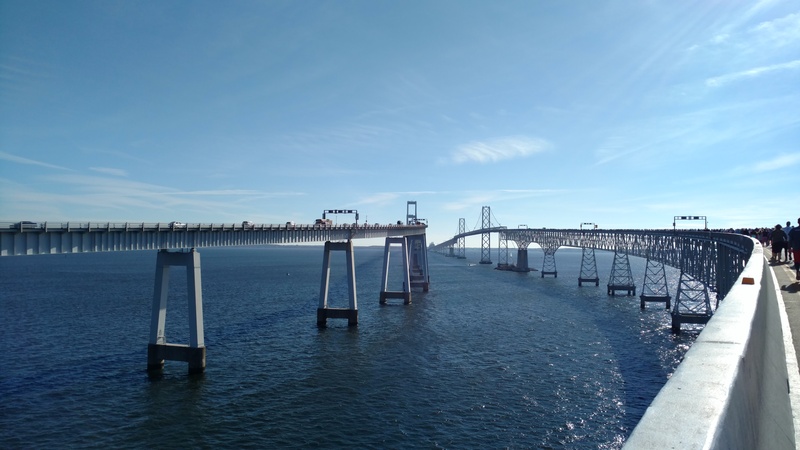 About 4.5 miles of the race are on the Chesapeake Bay Bridge itself, and then the last mile or so takes runners through a marina and down a road to a state park where the post-race party is. Unexpected Magic. We had a beautiful morning for our run across the bridge. The waters sparkled with boat traffic underneath us and there wasn’t a cloud in the sky! It was a tad chilly but I didn’t need anything more than my arm sleeves. Once again the organizers provided cupless water stops. There were huge coolers attached to pipes with water fountain attachments (for anyone who just needed a quick drink) or spigots if you wanted to fill up your own bottle. They are great about announcing this ahead of time so I came prepared with my own handheld bottle. I love how environmentally friendly this idea is and wish more races would adopt it. It really cuts down on trash and is more sanitary than random people touching cups as they fill them. My only complaint about the course is that there was some confusion at the beginning regarding which side the walkers/slow traffic should be on. I think most people assume that, unless otherwise told, walkers should stay to the right and runners pass on the left—just like car traffic. So most of us lined up that way in the chute. 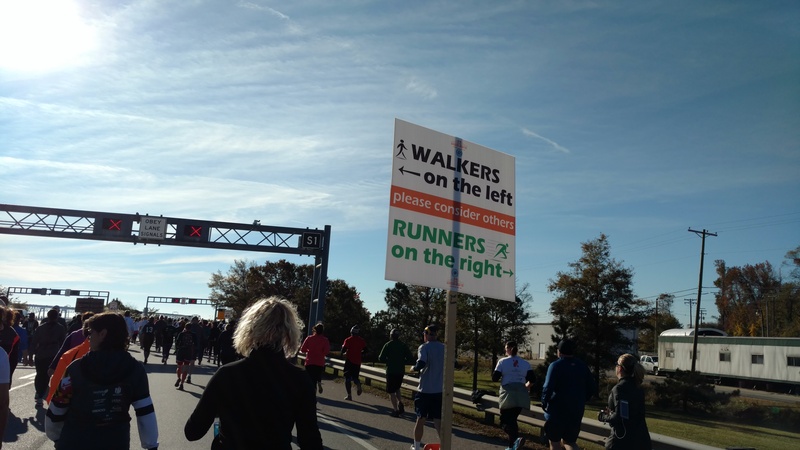 However, shortly after we crossed the starting line there were signs that walkers should be on the left and runners should pass on the right. So at the very beginning, in the most crowded area as we were winding up to the bridge, people were a confused mess trying to get to the correct side. If they had announced this at the starting line or had signs in the chute, it would have cut down on the confusion. If you like bridges, I highly recommend this course. 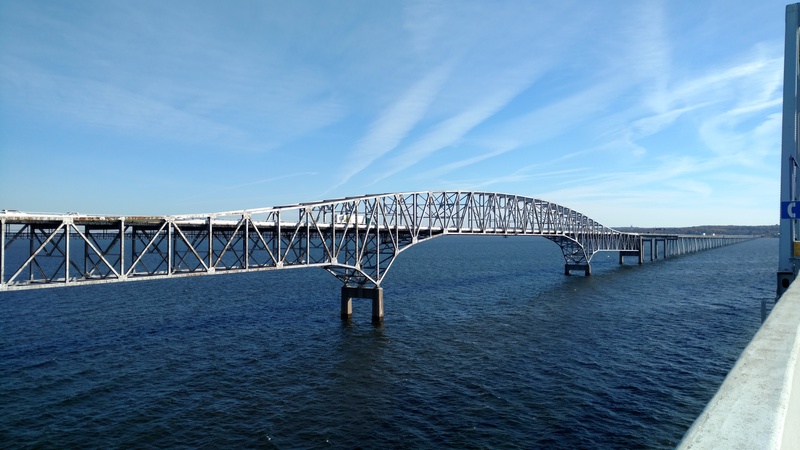 The Bay Bridge is a local icon and you are on it for most of the race. I love to look down and watch the boats (civilian and the police boats) on the water as I cross. There is a bit of a bounce to the bridge as everyone runs by, which can be a bit disconcerting if you don’t realize that bridges move that much. But on a clear day there really is no better place to spend your time in Maryland than close to the water, and running (or walking) over the Bay Bridge is a great way to do it. 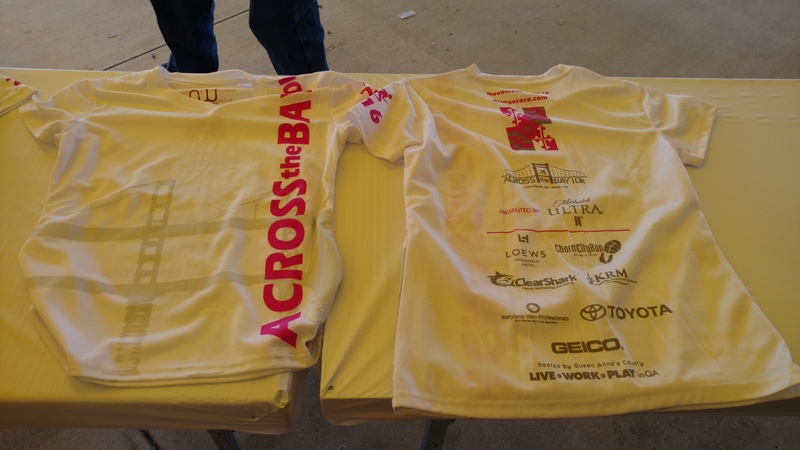 You can check out even more course details & stories from my review of the 2014 Across the Bay 10k race! I did not stay very long at the after party. I had had a busy weekend and still needed to do laundry and other stuff for the week. I walked through the official gear tent (just in case they had restocked and had my size) and then got in line for my bus. My parking lot is one of the biggest so it had the longest line. I waited probably 20 minutes (maybe more) to load a bus. 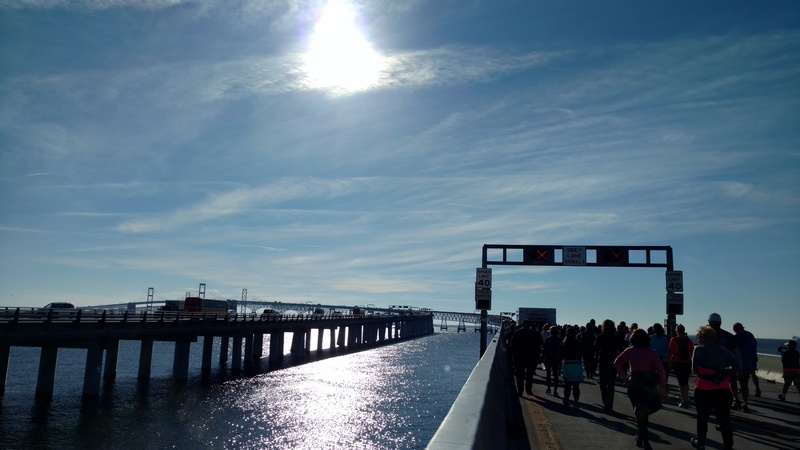 Once we got on the bus it took us over an hour to cross back over the bridge (there are two spans for the bridge—one is closed for the race so the other hosts traffic in both directions which results in huge back-ups). For some reason the bus driver didn’t return us to the same place where we were picked up and instead just let us all of in a random parking lot at the college. The campus is a beautiful wooded campus with lots of parking lots spread around—great for a nice quiet morning run but not so great if you have no idea of the layout of the campus or what specific parking lot you originally parked in. A group of us wandered around aimlessly for probably 20 minutes until we found someone to point us in the right direction. I would highly recommend the event organizers impress upon the bus drivers in the future that they need to return runners to the same place we were picked up. My iPod was on a great music streak. The shuffle churned up a lot of Adele and All American Rejects. But the best sequence happened as I crested the top of the bridge giving me a perfect soundtrack for the moment: “On Top of the World” by Imagine Dragons, “Glory Days” by Bruce Springsteen, and “The Lost Boy” by Greg Holden. As I mentioned earlier I do plan on doing this race for at least another couple of years so I can collect the full puzzle. I appreciate that they also offer a virtual option so I can still stay in the game even if I have to miss the actual event. The course doesn’t change from year to year and spectators are not allowed on the bridge for security reasons. But it still has kind of a party atmosphere (especially in the back of the pack) and offers a great after party. I highly recommend that every Maryland runner do this race at least once. Can’t get enough of touring the greater Washington, D.C. area? Check out our videos taking you on a tour of the Monuments & Memorials and visiting the Giant Pandas and other residents of the National Zoo! ← 2017 Special Discount Offer: Run & Ride with Casual Runner!